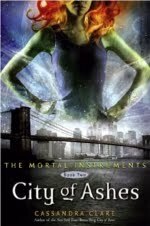 The book series is about fifteen- / sixteen-year-old Clarissa Fray whose mom Jocelyn has been kidnapped. In search of her, Clary meets the muscular, handsome shadowhunter Jace and - of course - falls in love with him. He explains to her, that shadowhunters fight the downworlders (a/k/a vampires, werewolves, faeries, demons etc.) that violate against an accord. Their home is a small country called Idris which is set, invisible for normal people/Mundies, between Germany and France. It turns out that Jocelyn was one of these warrior, too, but she turned her back on the shadow world and escaped to New York. 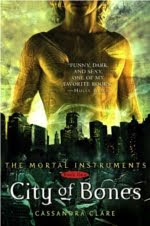 With Jace's help she finds out that her father is Valentine, the ex-villain of the shadowhunterworld: he tore his folk apart and startet a civil war which everybody lost. People thought for fifteen years that he was dead but really he had only been hiding - and now he kidnapped Jocelyn. And what is necessary if there's so much trouble? Of course, more trouble! Clary tells her best friend Simon about her "real" home (and about Jace ;D) and he tries to help her, but for the new shadowhunter-friends Alec and Isabella he's only standing in the way. Of course, it appears that Simon is in love with Clary and doesn't like it at all that she likes Jace. Aching for attention he somehow gets turned into a vampire during one of his standing-in-the-way-actions. So far, three books have been released and I read them all - and I'm thrilled! While reading I always had to smile because the story was so fascinating and perfect. There's been many laughs and of course, sentimental me, I had to cry pretty often. 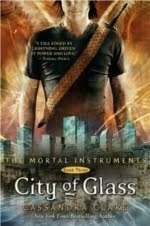 I think Cassandra Clare has done a great job! Personally, my favorite part has been... JACE!!! OMG, he's just perfect: he's handsome and knows how to deal with it, pisses people off to keep them on distance and he's so beautifully sarcastic ;D. I'd like to have a boyfriend like him, that would be fun. Hard shell, soft heart applies to him, it's only that the shell... is extremely big and resistant. If you're interested in these books, follow @cassieclare on Twitter, she posts monthly excerpts of the next book City of Fallen Angels until it's released. Clary made a surprised noise, but didn’t protest, even when Jace lifted her up and carried her over to the bed. They sprawled onto it together, crushing some of the letters, Jace knocking the box itself aside to make room for them. His heart was hammering against the inside of his ribs. They had never been in bed together like this before, not really — there had been that night in her room in Idris, but they had barely touched. Jocelyn was careful never to let either of them spend the night where the other one lived. She didn’t care much for him, Jace suspected, and he could hardly blame her. He doubted her would have liked himself much, in her position. Click here for the original posting! I received permission by Cassandra Clare to post the excerpt.